This is the 4th square of the 30 square Knitterati Afghan. The afghan commemorates Cascade Yarns® 30th anniversary. The 30 squares will be released throughout 2017 as part of the mystery knit-along. If you require the chart in written form, please contact us. Thank you. 5-st RPC-dec Slip 2 sts to cn and hold to back; k3, p2tog from cn. 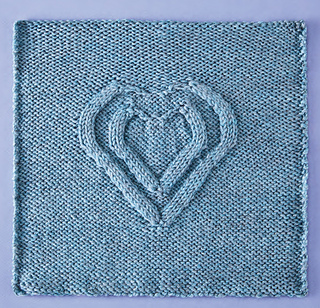 Traveling cables twist and turn to create this 3-dimensional heart on a background of reverse stockinette stitch. 20 sts x 26 rows = 4” (10 cm) in Reverse Stockinette using US 6 (4.0 mm) knitting needles. For helpful tips and videos for Block 4 visit: Cascade Yarns® Project page for Block 4.